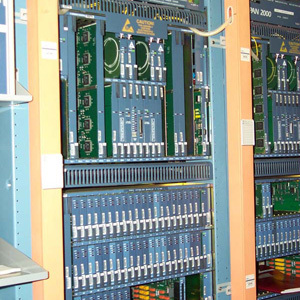 Alcatel-Lucent developed the LiteSpan 4000 as a follow-up to its more common 2000 series. These advanced SONET-based, next-gen digital loop carriers — NGDLC for short — provide ATM digital subscriber line as well as time division multiplexing-based narrow and wideband services from a single plug-in channel unit slot. The LiteSpan series supports a broad array of switch interface types and can manage them simultaneously via a single LiteSpan common control. Worldwide Supply offers a variety of refurbished Alcatel-Lucent LiteSpan 4000 multiservice platforms to build out your network with strength wherever you need it. The Nokia acquisition of Alcatel-Lucent brought these platforms under Nokia control and branding, but they continue to find widespread adoption. Earlier LiteSpan models were the first to offer SONET OC-3 transport. Now, these models also provide OC-12 transport, integrated ASDL2, 2+ and READSL2 capabilities. The Alcatel-Lucent LiteSpan 4000 series supports CES for transporting TDM over packet networks, remote unit support, MS-C operation, DS0 and DS1 TDM over Ethernet and a range of other advanced functionalities. The models have been discontinued and are reaching their EOL dates with Nokia. This means it is best to turn to a provider outside of Nokia for your purchase of a new or used Alcatel-Lucent LiteSpan 4000 series to protect that investment. We work hard to ensure that you have the right equipment for your network and that it won’t fail you when you need it. If you’re working with legacy equipment, we have the repair knowledge and existing parts inventory to keep your network strong and reliable. Contact us for any questions regarding the Alcatel-Lucent LiteSpan 4000 series or any infrastructure needs you have for your network and we’ll be right there to help.